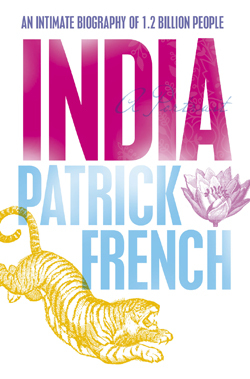 I picked up Patrick French’s book on India with quite some joy, having read his excellent and disillusioned book on Tibet and the slightly dusty, but remarkably detailed biography of Francis Younghusband and come away with information that I had not held before and a new, if slightly darker view of his topics. At the time I held this thought to be more mature – after all I did not want to be one of the people who know next to nothing about the places they visit, travelling only out of a sense of hedonistic adventure. But India, French’s book, proved to be a massive disappointment to me. This time I knew the subject matter quite intimately and French struck me as unbearably posh and conceited. An ivory tower wannabe mover and shaker who, the one or two times he stoops down to touch something a little more low brow, comes across as prejudiced and completely uniformed about the nature of the people he writes about. There is no humor and only the most rigid self awareness in his writing. His gift to render history clear and lucid is still there, but his endless focus on politics and economy is very wearying to me, because he possesses no real human understanding of his characters…the book is called The Biography of a Billion people, but the only people French is interested in are the high politicos. Yet the allure of India is that these politicians cannot lead as separate an existence as their ounterparts might be able to in other parts of the world. One cannot write about the rulers of a country without understanding the motivations of the people that are being ruled. The myriad of common fates that make India what it is are simply being ignored by French because he finds the few people who move mountains of money and wield power much more interesting. He seems to treat them with the same disdain of invisibility that he employed to write about the Western visitors to MacLeod Ganj who seemed so much beneath his notice and beneath him when he had returned from Tibet, where he had worked himself into disillusionment. The tragedy that he described in Tibet, Tibet seems now much more his own illusion of grandeur, less the despairing realization that Tibet was, in a manner, doomed. French’s self-importance starts at little things – speaking about Christopher Lee acting in a film about Jinnah without having seen it as if the casting choice could only have been a political decision – to his unerring belief that his interpretations are the only true and valid that makes his writing a guideline, perhaps, but a very unreliable one. Overall French’s book is very disappointing to me. Highbrow and unpleasantly British – perhaps it would have been fun bedside reading for Governor General Curzon, but for me it was uninvolving and presented a very slanted and unrealistic view of multifaceted India.